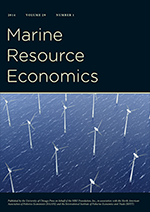 According to a forthcoming paper in Scientometrics, the top journal in environmental economics is the Journal of Environmental Economics and Management. Yawn. Everyone knows that. The more interesting rankings are for the next couple of tiers of journals. Papers in EE are heavily cited by papers that appear in EE. Most of these papers have little appeal outside of this community. Land and REE are published only four times each year. Fewer papers means fewer citations and lower impact factors. No offense to the Australians, but how does AJARE rank #6 in impact factors?